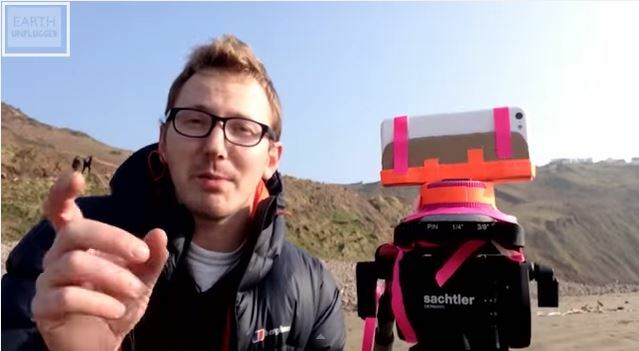 BBC Earth Unplugged presenter Sam Hume shares tips on getting professional wildlife film-making results with your smartphone. The BBC Natural History Unit is widely acknowledged as the best wildlife film-making department in the world. We’ve all seen the amazing footage they capture while creating some of the most iconic wildlife programmes ever made. But of course those shots demand professional cameramen and some of the most expensive high-tech video gadgetry on the market… or do they? Not necessarily according to the BBC Earth Unplugged team. Modern smartphones are remarkably capable filming devices, offering HD video straight from your pocket — but can they really be used for wildlife and nature filming? In this amazing video presenter Sam Hume shares some tips on how to achieve professional wildlife film-making results using nothing but your smartphone and a few home-made or inexpensive gadgets bought off the internet. From time-lapse panoramas using an egg-timer and gaffer tape, to low-cost underwater housings, macro attachments and slow-motion… we love these tips, and can’t wait to give some of them a try. Why not get out there with your phone and see what you can achieve? We’d love see your results on Facebook, Twitter or Google +.